Custom full color tote bag. Looking for a quality tote bag for an event, conference or business gathering to introduce a new product or design. 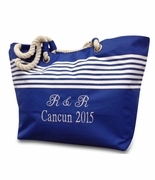 A sublimated tote bag with a full color image on both sides of the tote bag. Quality finishing with contrasting white top band, inside mesh pocket, front toggle and rope handles accented with grommets. Perfect for warm weather and beach destinations.